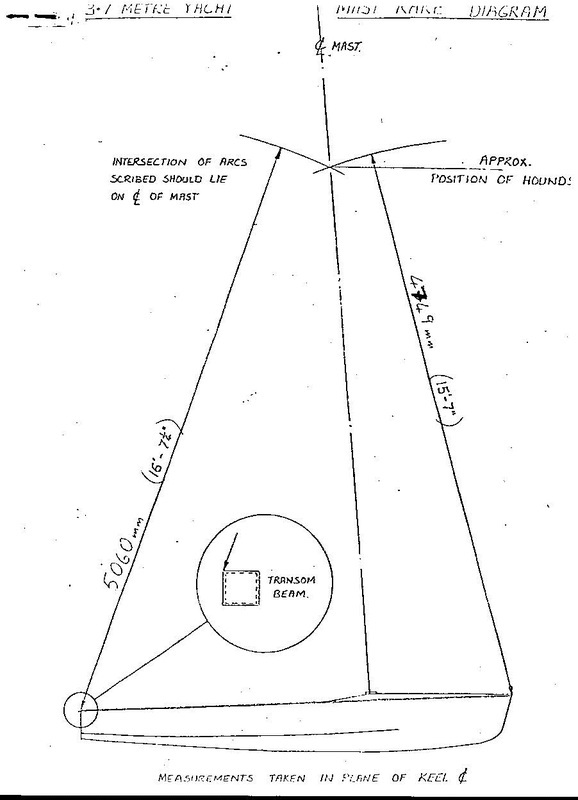 Use Bruce Farr's mast rake diagram as a starting point. Most top boats have recently had the centre of their mast set 60 -80mm (2 or so inches) aft of the intersection point of the tapes. When your boat is going well, use a stick to measure your forestay lashing so that you can set it at the same place every time, or experiment knowing what your rake actually is.. 4mm on a forestay changes the rake quite a bit (check it out and see). Use a measuring stick - don't try to experiment by the power of your biceps when setting up the mast. The writer's experience is that even though in principle everything should be equal, the forestay sets mast rake, while the tightness of sidestays affects rig tension before it seriously affects mast rake. Sailing upwind, it is definitely the forestay that remains tight, and upwind is where the rake matters most. Don't be afraid to vary your mast rake according to wind conditions, fresh or salt water. (Forward on fresh water, unless it is choppy). Raking your mast too far aft, or forward, will lose you upwind pointing ability. If your rake is too far aft in strong breeze you will capsize a lot. Some skippers believe that as soon as you are in big waves or chop, having your mast raked forward will make your boat bunt into the waves and go slow upwind. If you rake it correctly aft, the bow will lift nicely through the waves without you having to move back in the boat while trapezing. Bruce Farr designed the boat with a centreboard that was raked aft, and had the centre of effort aft as well. But some guys have made boards that don't get slimmer with depth, and are not raked... and they have gone well in all conditions. Your centreboard rake is related to your mast rake... you must find out for yourself how your boat goes best. Make sure your board has not been warped: (look down the trailing edge), and that the leading and trailing edges are good. DON'T leave your board or rudderblade lying in the sun - even if they are white and glassed! Once you are wiring upwind, don't be afraid to lift the board a bit to reduce the tipping moment, and go for boat speed, provided you are on open water with steady wind.. On confined waters with shifty winds, you are probably better off to keep your board right down, and to point high. Class Restrictions give you total freedom for your rudder design. At high speed, you will not have very good control of your boat if there is a lot of play in your rudder gudgeons. Unless something major is wrong with your board or rudder blade, 90% of your boatspeed will stem from your rig (mast rake, mast bend, and sail shape), assuming your hull and body are down to weight. Other things being equal, at 54kg you will probably start to feel a disadvantage in light conditions against 50kg hulls. Sit right forward, inside at the front of the cockpit, and heel the boat a little. Be careful not to pull the mainsheet in too hard - just enough to get the top of your sail working. Go for boat speed rather than pointing, unless you can do both! Do things gently. Throwing your body around in your boat will stop you dead in the water. Change tack while you have wind to do it in: try tacking in the middle of a hole, and you could end up pointing the wrong way, and unable to do much about it. This can be costly! Vang and Cunningham all the way off. 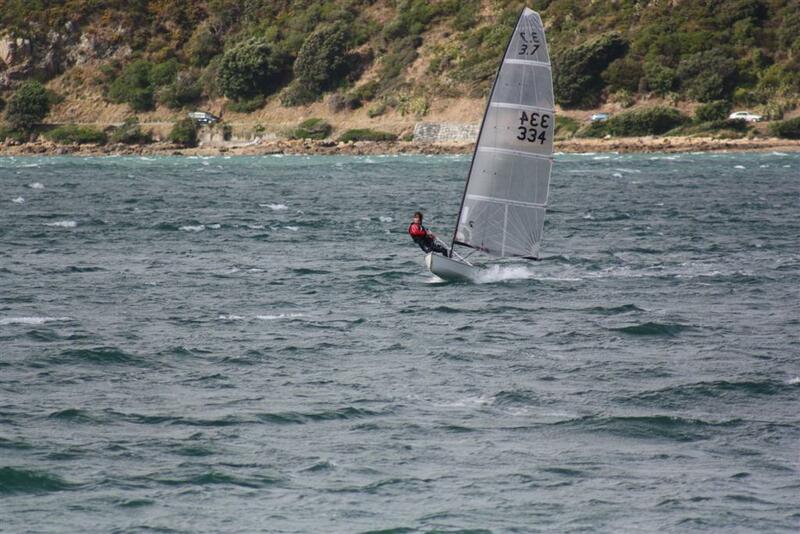 For reaches you want your centreboard half-up, for downwinds try and have as little centreboard down as possible. Note that if you have your centreboard to far up in a gybe, it can often catch on your Vang and prevent your boom from crossing the boat. Be careful about sitting as far forward as was good for upwind; guys who sit more aft (about the centrecase) offwind may well overtake you..! Again, if you can guess where a non-existent wind will next come from, position yourself to get it first! Always feel for that feeling of acceleration. Move your weight to get the most out of it... but don't throw yourself around to make artificial propulsion. It is too obvious in a 3.7, and you gain a lot less than you would in a canoe-shaped hull like a Laser. Diamonds: some believe that you can gain a little boatspeed by loosening your diamond wires just a little in these conditions. Trapeze wires: if you have adjustable ones, shorten them so that you are trapezing high. This can make it easier on your legs when you have to crouch half in/half out. It is also easier to avoid being dunked if a patchy breeze suddenly dies on you while you are wiring. Stack/crouch/trapeze about where the traveller is (or at the aft end of the centrecase if your boat has no traveller), leaning yourself forward on flat water, and throwing out your weight to drive the boat high (upwind). A basic rule for learning to trapeze is to keep your weight on your front leg by keeping it stiffer than your back one. BUT if you are in and out a lot, or half-crouching, beware of swinging your bodyweight aft through keeping your front leg straight. This is OK if you are tacking, and have to move aft to cross behind the traveller anyway. If, however, you are trying to maintain boatspeed upwind, you should not swing aft, lifting your bow and sinking your stern. This slows your boat. If you are continuing to sail upwind, keep your body weight centred around the traveller. It is often a good skill to learn to bend both legs and keep your balance if you can't commit to keeping your front leg straight all the time. If you crouch in because the breeze lightens on fairly flat water, try crouching forward up by the chainplate, and heeling the boat just a little. This can drive the boat up to windward a little, and give it that more responsive feel - similar to how you sail upwind in very light airs. As the wind comes in, get your bodyweight back to the correct position by the traveller. Keep the boat straight upright, and it will accelerate. Let it heel, and it will round up, and stall. If you are wiring in choppy waters and the wind drops, leaving you sitting in and wallowing around with no feel at all, try raking your centreboard vertically. You should get heaps more feel in the helm, but this might NOT translate into speed as the wind comes back in! Try NOT to pull the mainsheet in too hard: this is all too tempting in a boat where you are using your massive thigh muscles to go out on the wire. Once you are out and feeling secure, let the main slip until the top of your sail starts to exhaust.. then pull it in to where you feel that maximum drive through the water. When the wind is up and down a bit, try trimming your main constantly instead of cleating it. Cunningham still off. Kicker on just enough to stop the leech twisting too much. Traveller out. If there is enough wind to get you planing, use either some kicker or main to tighten your leech enough to make sure you are getting maximum power out of your sail. The extra speed and acceleration you can get from planing better than the others is a crucial factor in this class. In the gusts, especially if you are up to planing, try to bear away and head a little downwind. You stay in the gust longer, and your speed is good due to the apparent breeze. As the wind dies away, point up a little: you gain a little boatspeed by pointing up a bit on a reach in the light, and if you move upwind a bit, you spend less time in the hole because the next gust hits you sooner. Trapezing on a reach can also gain you a lot in speed: once you are out on the wire with that extra speed, the new apparent wind can actually keep you there for a while.. If the gust is really marginal, you may need to point up a bit as you get out on the wire and get your speed up. You should then be able to come back to the right direction at your improved speed, and make some profit.. If, however, the wind dies too suddenly, you may have been better off to stay stacking, and re-read the previous paragraph... You tend to slow your boat getting on and off the trapeze, so you need to develop a sense of when it is worthwhile. The 3.7 planes best when it is level - not heeled. Diamonds tight, outhaul out to the black band, cunningham hard on, kicker hard on to increase mast bend, helping you to depower the rig and hold better sail shape if you ease the main in very strong gusts. Keep the boat flat (mast vertical) - do not let it heel. Lengthen your trapeze wires so that you can wire as low as the waves will let you, once the wind is strong and reliable enough. Compared to most other 1-man boats, the 3.7 tends to plane and perform better in strong winds if you sail free and go for speed, rather than point high up into the wind. Once you are fully wiring and starting to spill some power, your traveller should be at least out to the first stringer, and as the wind gets stronger - ease it further out. If your boat has vang sheeting and no traveller, put the kicker on just hard enough to keep the sail shape right (the more wind, the more kicker) then ease your main out to the point where you get the optimum combination of boat speed + pointing. If you point too high with your sail in too far, you will simply go slow. (A well-tuned boat will point higher with good speed than a boat that is not so well set up.) If Lasers, etc, hold you up by pointing too high, don't hesitate to shoot through beneath them. 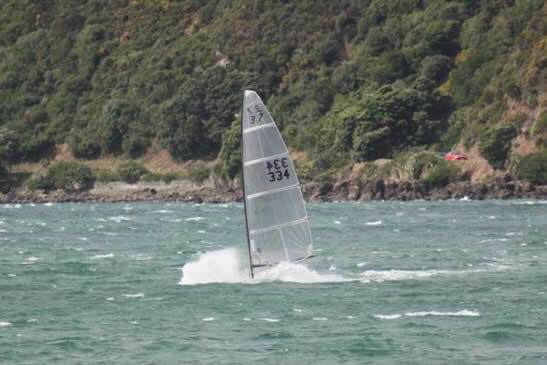 Many like to lift the centreboard half way up or so when the wind is strong: you are moving through the water faster, and need less centreboard area, plus you seem to have less 'tipping over' effect when the gusts hit if the board is not so far down. If you have to ease the main every time a gust hits, you are overpowered: your mast is set up too stiff, or your sail is too full for it. People are tempted to set their rigs up too powerful so that they can get out on the trapeze as early as possible in moderate airs. You need to make your rig just powerful enough for this, but also still flexible enough to bend a bit, flattening the sail for you when gusts hit in strong winds. Basically, your rig should flex enough for you to be able to cleat the main, and just use a little tiller to keep the boat flat and pointing the right way when the gusts hit. Trapezing position: some say that you should move a little aft of the traveller in strong winds to keep the bow up so that it doesn't bunt into waves... others say that if your mast is raked back to the right point, the bow will lift through the waves anyway. You can actually relax a little upwind in a blow while you are trapezing, and feel a little smug about all those guys giving themselves twice the work and half the fun in stacking boats! Going about: Do not push the tiller too suddenly - try to keep on as much boat speed as possible. Turn the boat just after the bow has gone through a wave, so that the next wave will help push the bow around. Get in off the wire quickly, but allow the boat to heel a little towards you as it turns, so that you are climbing uphill a little as you go across to the other side. This will help bring the boat around and avoid getting it into irons, which is easy to do when the mast is raked well aft. Going about Bruce Farr style (not many others have mastered this! ): Cleat the main and throw the loose end into the boat. Pull yourself up on the trapeze handle to take your weight off the ring, so that it falls out of your hook. Change tack from out on the wire with full speed on. During the panic trip across the boat pull the main out of the cleat, immediately pull it in and cleat it on the other side. The boat will be almost right about by now, but do not let it point far enough away from the wind for full power to come on at this stage. As soon as you drop your backside on the sidedeck, use your free hand to hook up real fast, then jump out pointing the boat onto the proper course, even luffing a bit if you're getting overpowered, also using your powerful leg muscles as you go out to pull the mainsheet in to the tension you want it at. (Beware oversheeting by doing this, especially in moderate conditions!) Many top skippers use other methods, the main difference being that they ease the main as they get in, and stay hooked on until they are in the boat. If the trapeze shockcord runs from the side of the cockpit floor (not from the deck) and you angle your stomach a little as you come in, the trapeze ring will automatically drop away from your harness. In light breezes you simply climb up onto the centreboard, and as you pull the boat up, you let it swing into the breeze, so that as it comes upright, you climb aboard, head to wind.. No more problems. Intelligent solution: When the wind is too strong, don't fight it: roll with it ... ie, as the wind gets under the sail and starts to flip the boat over on top of you, DON'T try to clamber into the boat and crawl over to the other side. Instead, as soon as you see the mast tip lift, and you know the flip process is on its way, SLIP YOUR BODY DOWN UNDERNEATH THE CENTREBOARD - straight down into the water, the opposite of what your instincts tell you. As you go underneath the centreboard, the boat will flip, and suddenly you will find yourself lying on top of the board, with the mast downwind of you, your weight having stopped the boat's natural tendency to go right upside down again. Now you can easily right the boat (the mast being to leeward - no more flipping). Remember to let your Vang off! You simply will never get the boat back upright if the Vang is strapped on. One owner has claimed an improvement on this technique: instead of slipping your body under the centreboard, he says that you should reach right down under the water and strongly grab the underwater gunwale, so that as the boat does the flip, you actually arrest it in the upright position, and save time. This technique is certainly theoretically feasible, but you may need a very long arm. If you can make this work, let us know how! The short-armed writer has not yet managed this trick! 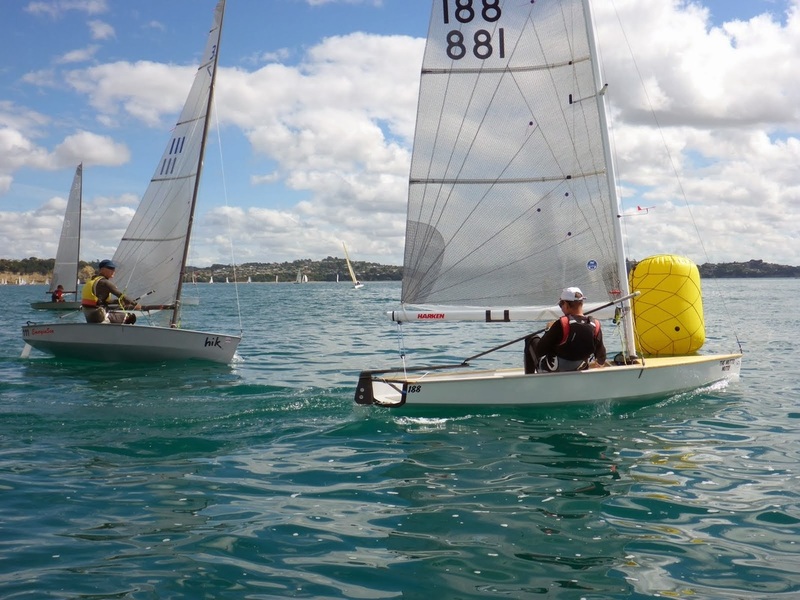 In moderately strong conditions, it can be difficult to decide in advance whether to climb quickly across the boat, or to go underneath with the centreboard. If you clamber across the boat quickly enough and gain control of it, you profit. But if you fail and the boat goes upside-down again, you lose heaps of time. Ironically, you may find that if you slip under the board and go under the boat, the boat does not in fact flip: it stays upright, head to wind, with you clinging to the centreboard about 1 ft under the water! Great... You wait to see which way the boat is going to turn (or if you are short of breath, push the boat around yourself), so that you can rise to the windward gunwale, easily pull yourself into the boat, and sail away. You must pick the windward side! All this is time-consuming, but a lot less damaging than letting the boat go upside-down again. Gybe at full speed on top of a wave, with the bow out of the water. The faster you are going compared to the wind, the less you will be bowled over by the force of the sail coming across. That force can be met by several methods: Heel the boat slightly to leeward before you initiate the gybe. As the sail comes across with massive force, the boat will not be leaning the wrong way. (You have angled the boat under the rig in advance of the gybe). You must also use your bodyweight to counterbalance this force, but most important of all is the tiller. Having turned one way to initiate the gybe, you may have to compensate for the force of the sail going across by turning the boat a bit back the other way. The aim is to keep the boat level (mast vertical) and controllable. If the boat comes out of a gybe with the mast leaning to leeward, chances are you will swim through doing a bad round-up. Bruce Farr described the movement as a zigzag. To initiate the gybe you steer towards the side on which the sail is, and then you steer back the other way as the boom goes across to counteract the round-up when it gets there. (Don't overdo the correction, or you may get another gybe you didn't expect!) All perfectly logical... In moderate winds one can gybe with the bow up in an impressive quick spin, so that the boat comes so far round that the sail flaps upon coming across. In stronger winds, it is safer to gybe first, then round up separately. Reaches on the wire in strong winds are ultra-exciting, and whatever shortcomings the 3.7 may have as a design in other areas, this is where the 3.7 rulz!! Board half up, traveller right out. In strong winds, use your lower ring instead of the usual upper one, or lengthen your adjustable trapeze wire a little. As you swing way out near the stern of the boat you lift the bow, getting extra leverage and control over the boat, for a truly thrilling ride. (Don't lift the bow like this unless the wind is really strong.) Kicker hard on if you want maximum power - and you can handle a lot more power on a reach than you can upwind. But if you are getting knocked over instead of accelerating (is your board half up?) let your kicker off so that the sail twists, and you sail off the bottom half of it. It is perfectly good (and safer) to do this in strong winds on reaches. But pull your kicker on again for upwind or flat off downwind. Keep the boat vertical. You have less control if you heel the boat at speed. It is faster to trapeze, but the broader the reach, the riskier trapezing becomes. In bouncy, choppy water and/or treacherously shifty winds, you can suddenly find yourself floating in the air, out forward and round the front of the forestay... and as you hit the water, your boat does a spectacular cartwheel which you don't even get to see! In these conditions, watch your wind indicator (preferably on the foredeck so you can see the waves at the same time), and when it wavers, be ready to jump in, or resist forward pressure by having your body angled and your front leg straight. You can sometimes save yourself by dropping your back foot into the water - and angle it forward so that by deflection of the water it is driven back in towards the hull, countering the force that is dragging you out and forwards. (This force is usually caused by deceleration, either through shifting/disappearing wind, or the bow bunting into a massive wave that you hadn't noticed..) Being sensitive to the feel of the boat will help, but you need time on the water in these conditions for that. As you point lower while on the trapeze and feel danger symptoms, you have to decide whether to go for high-risk speed (stay on the wire) or safety with a little loss of speed (get off the wire and stack on the side of the boat). There is a half-way point many seem to miss: put your back foot in on the cockpit floor against the outside stringer. If the wind shifts or rises, you are already on the trapeze and ready to benefit. If it drops, you can bend both knees, and swing both in and forward a little. Trapeze wire length shorter in moderate winds, longer in stronger winds. You are almost standing at times in this position, but unless the wind really dies, there are advantages. On very rough waters with tricky strong winds that you will probably strike only once every few seasons, you may find it helpful to have a loop about 18 inches forward of the transom to hook either your toes or your heel into. In some conditions, this is all that will save you from that all-too-sudden flight around the forestay. This loop should be on the gunwale. Some use strong cord in plastic tube; others use a stretchy material, hoping to avoid a broken foot if the boat still cartwheels.. If you do use such a loop, be careful when you come to pull your foot free that you are well braced against your front foot. If the wrong thing happens while you are pulling your foot free, you could still suffer exactly what the loop was supposed to prevent (ie, loss of contact with the hull...). You must be ruthlessly aggressive in controlling the boat: get the feel of it, and steer/angle it where you want it to go. Sitting and reacting to where the boat wants to go is a bit disastrous - you will probably swim. Sit right back on the transom. If you let the bow dig in, you lose control. STEER UNDER THE RIG - use the tiller to correct any heeling by steering under the mast/sail, whichever way they lean. You can make only limited use of your bodyweight while you are huddling over the transom concentrating on an ultra-sensitive tiller! But if you use that ultra-sensitive tiller correctly, you can start to perform miracles. The top guys (including Bruce Farr himself) have done it, and still can.. so don't listen to failures who blame the boat instead of themselves. The boat is more controllable while it is level (not heeled) with the bow raised, and while the tall, skinny sail is NOT letting wind spill out the top. KICKER HARD ENOUGH ON to stop the leech twisting away at the top. On a reach you were able to let off the kicker and let the top of the sail twist away , but that is safe ONLY if the top of the sail will flap: you CANNOT do this flat off. Keep the sail straight in the leach. Waves can be a major problem. On flat water the 3.7 is relatively easy to sail all round. Confused, big waves make the 3.7 a difficult boat offwind in heavy conditions. Avoid running straight into waves offwind: if you look and pick your way (one of the arts of sailing) there is often a surprising number of ways around or away from that fatal plunge straight into a wall of water. Use tiller and bodyweight to keep the mast vertical. When conditions look predictably "difficult", refer back to REEFING POINTS. At a certain point, only reduced sail area will really give easier control. 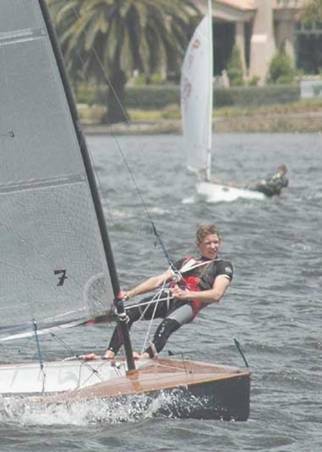 Anti-reefers point out that serious races are usually cancelled or abandoned in such conditions... but the writer thinks you should enjoy the experience of sailing a more controllable 3.7 in such conditions. Rounding up to point into the wind while planing at 100 mph offwind (flat off) involves one golden rule: NEVER try to do it while the boat is heeling to leeward. You must have the boat either level, or heeling slightly to windward (following the principle of steering the boat under the rig). When the boat is leaning the right way, push the tiller away to leeward, and move forward quickly from the transom to be sitting up on the deck, because you will probably be blown over if you are too slow. In really strong winds, you go forward and jump straight out on the wire. You can be sitting upright/crouching in the harness with the sail flapping: this is much safer than sitting on the deck because you can throw your weight out if need be. Sitting on the deck, you can be pulled straight over by the 3.7 rig, no matter how hard you lean out. If you haven't got effective non-skid on your gunwales and cockpit floor, don't bother going out! This is where the 3.7 is the most fun: you are right out on the wire, (you can even relax a bit upwind) throwing away a bit of power, and converting the rest into speed. The boat is ultra-lively and responsive. You don't have to be monstrously fit and gorilla-strong like you do for a Laser, but you need to be reasonably agile, and at least a little experienced. If you are really new to the game, it is not at all stupid to avoid the really strong winds until you have mastered the moderately strong! On flat water, with an experienced skipper, the 3.7 can handle the same conditions as most other yachts. On rough, choppy water, reefing points may be advisable for better survival when you hit crazy speeds offwind, resulting in buried bow, loss of equilibrium, etc. Reefing points about 30cm up from the boom give you the option of a boat that is much more controllable in these conditions. In high winds, bouncy confused water makes your 3.7 more difficult to control. On flat water, reef when people are saying nobody should sail (25+kts). If the water is really rough and confused, think about reefing at 20kts. The 3.7 is THE ultra-exciting one-man boat. You can get all upwind thrills while the trapeze allows you to partially relax at the same time. 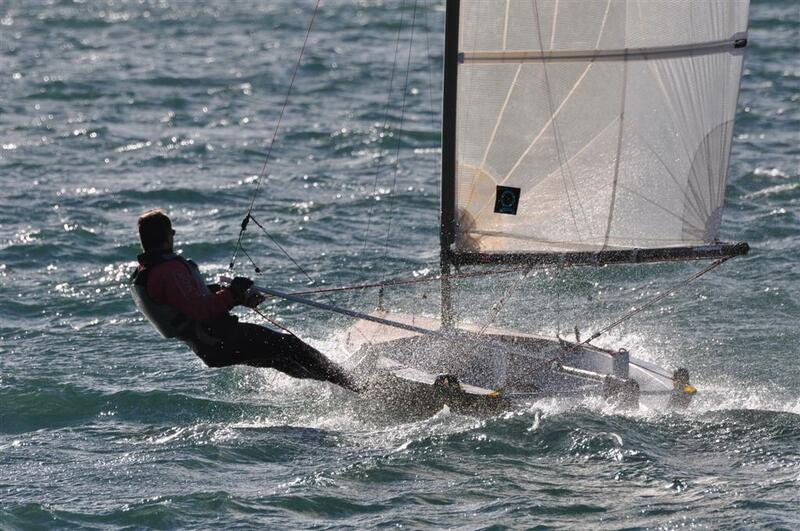 Downwind thrills take all your energy, brainpower and reaction speed.. While waiting around before the start, spilling wind from your sail, etc, beware of sitting in on the side of the boat - it is quite likely that a sudden gust will simply blow you over. You are much better off on the trapeze, where you can still let your sail out, point up while crouching, or bear away to avoid being dunked when the wind drops, and use your full power to keep upright when the big gust hits... If you choose to sit in, either you are super-good at spilling power from an over-powerful rig, or you weigh 15+ stone. Your rig was designed for a person on the trapeze.